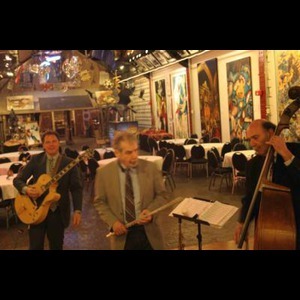 Artisan Jazz specializes in a smooth, rich, unintrusive, approach to a wide repertiore of jazz and blues. 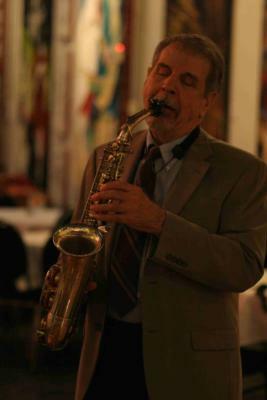 The core of the band is a trio of seasoned musicians who have performed with many artists such as Gene Bertoncini, Frank Vignola, Ike Sturm, Steve Greene, Bob Sneider, Jeff Campbell, and Clay Jenkins. 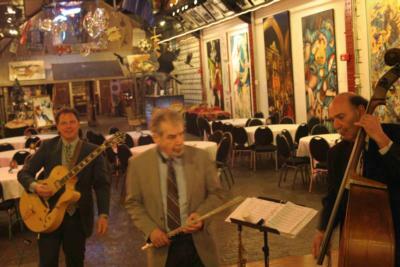 The trio will bring in a drummer/percussionist if your event will have dancing. We hired Artisan Jazz to perform for my parent's 50th Wedding Anniversary party and we couldn't have been happier with them. They were on time and professional. They provided the perfect background music during the event. They definitely helped make a very special evening all the more special! Artisan Jazz was perfect for my event. They offered a drummer as well, and about 30 days prior we decided to take them up on the offer. I loved them without the drummer and I loved them with the drummer. Very nice people and good musicians. Liz, THANK YOU!!! SO much for the kind words, and also for having us. It was a great party. We really enjoyed playing for you. Thanks for your gracious hospitality and we wish you and Kevin all the best. CHEERS!!! Please note Artisan Jazz will also travel to Henrietta, Pittsford, East Rochester, West Henrietta, Fairport, Mendon, Penfield, Rush, Fishers, Honeoye Falls, Scottsville, North Chili, Ionia, Victor, Webster, Spencerport, West Bloomfield, Churchville, Lima, North Greece, Caledonia, Adams Basin, Avon, Farmington, Macedon, Mumford, Union Hill, East Bloomfield, Hilton, Holcomb.